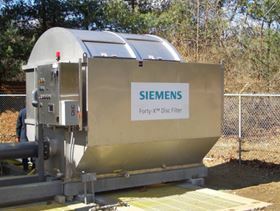 The Siemens Water Technologies filters will allow the plant to increase design flow capacity from 6 mgd to 9 mgd, with a peak flow capacity of 18 mgd. The project also changes the plant’s process from conventional activated sludge treatment to advanced biological phosphorus removal. The disc filters will replace the Sycamore Creek plant’s current sand filtration system, which has reached its usefulness due to increased flow volumes. Three of the disc filters will be operational, with one remaining in stand-by mode.